Prior to becoming a full-time liveaboard cruiser, what I did in the bathroom was my own business. 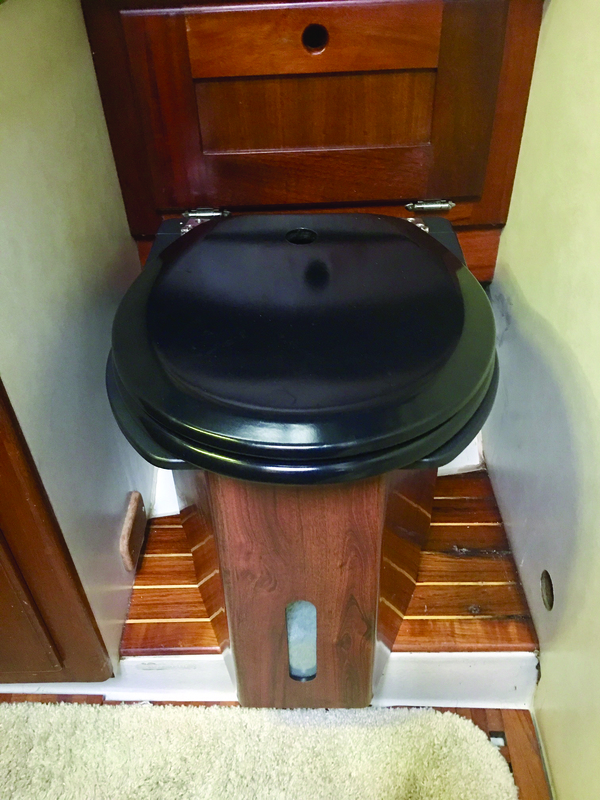 If you own a boat with a head and you’re nodding because you also have personal business in there, it’s likely that you’ve never installed a composting toilet with your spouse. 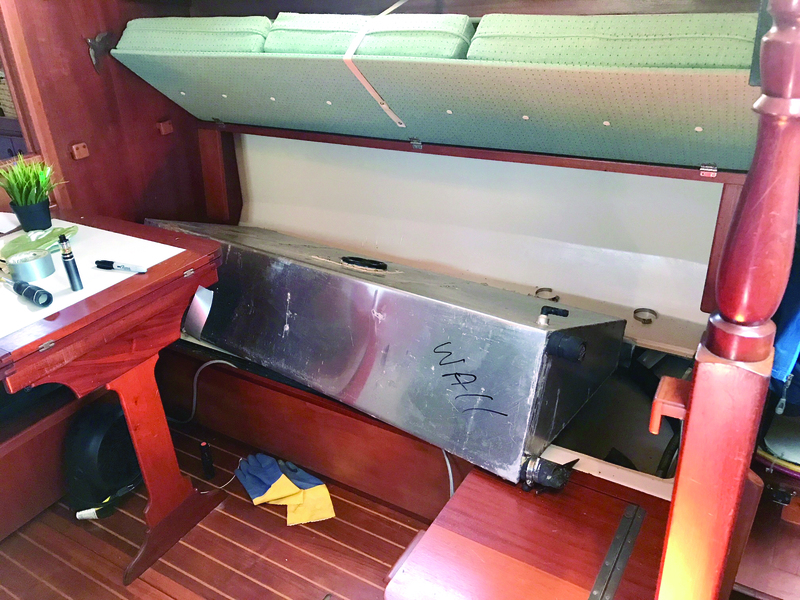 In the spirit of good boats gone bad, the sanitary system on our 1986 Gozzard sailboat gave up the ghost, so we were faced with the possibility of long walks to the facilities, even longer discussions about a pull out and costly plumbing reconfiguration, or the comparatively inexpensive quick fix of a composting toilet. 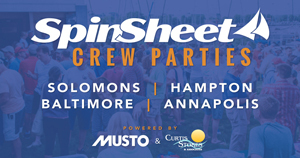 Bring up toilet paper in the head at your next docktail party and you may as well have asked whether a catamaran or a monohull is better or how much cruising costs. I’ve rarely participated in bathroom banter because I’d rather chat about provisioning and anchorages, but suddenly I was thrust into the depths of a probing investigation on composting toilets and their accessories. What is a substrate, which one is best, and can you get it while cruising? Which brand has the catchiest sales pitch? What are the YouTube sailing vloggers using? Lastly and most importantly was finding a composting toilet that wasn’t a giant plastic monstrosity. Our Gozzard’s interior is completely paneled in Honduran mahogany; after researching the popular brands, I was discouraged with their large footprints and plastic construction. When we arrived at the bottom of the research rabbit hole and discovered the C-Head, we were sold. The C-Head features a small footprint and comes in two models for varying space constraints. There are five body styles, a choice of a black or white lid and seat combo, and a base in either plastic or teak, cherry, and red or dark mahogany veneer. The customized shape and veneer coordinate perfectly with our mahogany finishes. We were duly impressed with the simplicity of its inner workings. In addition to the C-Head’s myriad customization options, it also offers two inexpensive accessories to enhance your time on the throne. The Lady’s Maid is a simple ladle with a one-inch hole drilled through the middle of the bowl. It is snugly cupped just so while seated with the ladle’s hole aimed forward ensures that liquids always flow into the basin. Ladies will need to figure out their own “just so” position. I can’t help with everything. The Lady’s Maid is especially helpful for women who are unsure of how far back or forward to perch on the seat. For men, The Easy Peasey is a simple transmission funnel that those who prefer to stand can use to ensure their aim is true every time. The ladle and the funnel are available when ordering your new C-Head. Both items are also conveniently purchased at the dollar store and many additional box store retailers near the Bay. The C-Head’s waste collection system features options for almost every head configuration including off-road vehicles and boondock camping setups. Liquids can be collected in a common one-gallon milk jug, diverted to the collection tank of your choice including your holding tank, or collected in a sealed and secure P-Tank for offshore sailing. There is also a pumping option if your preferred liquids receptacle is above the toilet. Solids are collected in a customized five-gallon bucket. We selected the optional churning system, requiring less substrate than the non-churning model and offering an easy emptying process that we’ve found to be dry and inoffensive. As full-time liveaboards, we empty the bucket about once a week. It’s not a dirty job, but someone’s gotta do it. We may or may not have drawn straws the first time. Since installing a composting toilet, we removed our old 40-gallon holding tank and its ancillary hoses, so we’ve gained a huge amount of storage space. We’re actively experimenting with how many bottles of rum the area will hold, and our best guess is “a lot,” so everyone’s invited for sundowners. Hello, Dark and Stormys! It feels odd not to flush because flushing has been ingrained since childhood, but hey, I’ve never pooped in a bucket either. I’ve also had a few mishaps since we installed this toilet, all completely of my own making. I’ve overflowed the liquids container once, but only once. A box of wine may have been involved, and I may have neglected to peek through the convenient liquids-level window. Believe you me, I now peek regularly. Keeping an eye on the level of your liquids is a must with any composting toilet. Fortunately, the C-Head’s interior compartment is sealed well to account for rare mishaps of this nature. A proper and centered seating position is essential when using any composting toilet, lest you inadvertently deposit your materials into the wrong compartment. This may be more applicable for women than men, especially those of us on the petite side. At first, it was a crap shoot. However, I got used to it quickly. Don’t ask how I know this; just go with it and get yourself properly positioned. It is also recommended that men sit down for all activities, but everyone knows that “sailors sit,” so men should be comfortable with this when they’re aboard. The initiation period with our new composting toilet sparked intimate conversations with my husband about previously uncharted territory in our relationship. After all, this business in the bathroom used to be private. Many liveaboard couples can proudly say that moving aboard strengthened their relationship. While we adamantly belonged to that set when we were flushers, our bond over churning, emptying the containers and learning to laugh about it, and selecting the best substrate through trial and error has brought us closer than ever. Our new composting toilet has offered us an increase in storage space, one less thru hull to manage, a dramatic reduction in plumbing, and the convenience of never scheduling another pump out. With these numerous benefits, I challenge you to find a composting couple who wishes they’d kept a flushing sanitary system on their boat. Follow Tiffany Bee’s adventures at sea and on land, but not in the head, at thesailboattara.com.